What if you got a summer job that requires you to pretend to be someone's boyfriend but you didn't find out until you've already accepted the job? Well, that is the beginning of Summer Wars. What if, you were a maths genius as well and manages to accidentally break into the world's most secure communication system without knowing, what would you do? 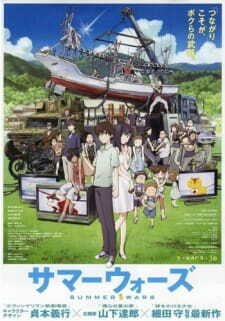 Summer Wars is your typical sci-fi anime film with a bit of romance thrown in. It heavily focuses on the 'OZ' network and how it was infiltrated just in one night accidentally by Kenjo Koiso. The story is short and sweet which gets to the point. I found the sci-fi more prevalent as a central theme than romance or slice of life. The main idea of the story is well told from many different perspectives although not directly. We focus on the main character and how he saves the world in the end. The art was not too bad. A bit shallow but bearable to the end. The characters didn't have much texturing or shading and they looked a bit 'pale'. Aside from the characters, the scenery and backgrounds were pretty well illustrated. The animation of the 'OZ' network and the avatars were pretty amazingly done. The 'Love Machine''s final transformation was amazingly animated as it captured every avatar it controlled in a coagulated state. Music was well composed and appropriate to the film. I felt that the voice acting was a tiny bit off when comparing with the characters. I felt that maybe the voice acting could have been better with a different cast or with some minor tweaking. Overall, it was not bad and you got used to it in the end. There were lots of minor characters in the film. Although we do not directly explore each and every character in the film, they all had a minor role to play. We focus on the Natsuki's family and we get to know a bit about their background which in turn, leads to the final decision made by Kenji. I did not get attached to any characters as this was a film and time was limited. Overall, it fun to watch and to enjoy as a quick one-sitting anime. I'm glad that no time was wasted in explain details greatly, but you do get the overall picture of what is happening in the situation. This is a film meant to be watched when you have a couple of hours to spare and just want to watch a quick story. It is a pretty good sci-fi story and it does not waste any time getting to the point. Shadowing and texturing could have been better. The backgrounds were good. Voice acting a bit off. Soundtrack was decent though with nice classical instrumental score. Too many to count. I did not feel any attachment to any of them. Hacking into the world's most secure system? Yes please! It was fun to watch and to enjoy. Worth it when you have a couple of hours to spare.